✔ EXTREMELY POTENT: 450 billion live bacteria (Streptococcus thermophilus DSM 24731, bifidobacteria (B. longum DSM 24736, B. breve DSM 24732, DSM 24737), lactobacilli ( DSM 24735, DSM 24730, DSM 24733, L. delbrueckii subsp. bulgaricus DSM 24734)); maltose, anti-caking agent: silicon dioxide. ✔ ECONOMICAL: This is an excellent alternative to a branded product available in the UK – manufactured to the same specifications in the same factory – but because it is non branded we can offer it at a lower price! ✔ STORAGE: Vivomixx should be stored in a refrigerator (2-8°C). If unopened and stored refrigerated, the product can be used until the “Best Before” date shown on the base of pack. 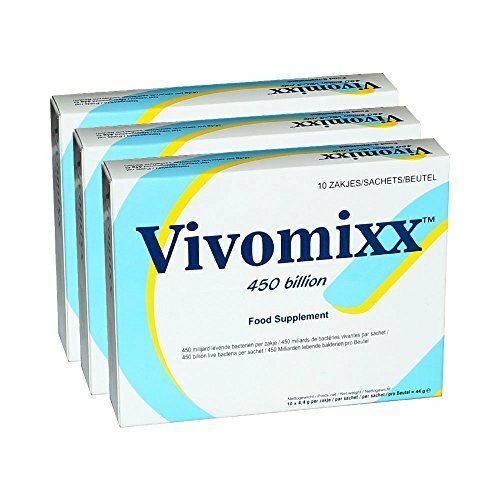 Vivomixx can be stored at room temperature (up to 25°C) for up to 7 days without adversely affecting potency. ✔ USAGE: For adults and teenagers, take 1 to 4 sachets daily. Open the sachet and stir the contents into cold water or any cold non-frizzy drink or food and consume immediately. Do not take with hot foods or beverages. Do not exceed the stated recommended daily dose. Vivomixx is safe and can be taken for as long as recommended by your healthcare practitioner. ✔ ALLERGENS: Contains milk (a milk-based component is used in the fermentation process for one of the bacteria and trace amount may be found in the final product).